This guide explains how to adapt a Mad Catz "PC Con" USB controller for use with disability standard switches on a PC or Apple Macintosh (OSX). This will enable switch users to use from one to three switches with their PC to play games and much more. Most of the components used are commonly available from Electronics stores such as Maplin Electronics, apart from the "PC Con". These can be found in Asda in the UK and eBay internationally. Soldering iron (15 to 30 Watt power); thin solder; soldering flux; de soldering braid; thin wire (e.g. 16 strand 0.2mm). Cordless drill with 1 drill bits (1x 1/4"); Knife or wire strippers; small screwdriver set. 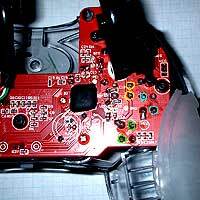 Remove the 7 screws at the back, then carefully prize the controller apart, taking note of how it will go back together. 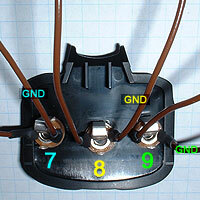 The encircled points are the three switch contact points that are easy to solder switch sockets to. 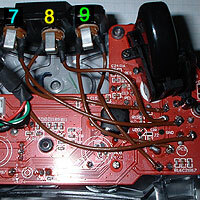 These are recognised by a PC as switches 7, 8 and 9. Remove the pictured plate. 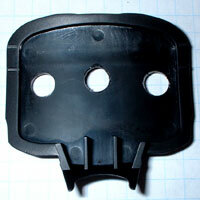 Make pilot holes on the back (I always burn these in using a soldering iron) then drill your 1/4" holes. Not all sockets are connected alike, so you will need to find which 2 of the 3 contacts you need to solder to. Attach a test lamp or multi-meter to any 2 contacts. Plug in your switch, then press it. If the lamp comes on when pressed you have the right connections, otherwise try a different combination. There's only 3 possibilities. Solder two 14cm lengths of wire to each socket. Melt shrink wrap around the solder points to help prevent shorts. Spread some super glue around your sockets before screwing them into place as pictured. 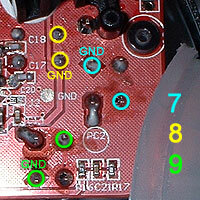 Very carefully solder the sockets to the PCB as pictured. When in place, push the wires up away from the black blob (resin protecting the microprocessor). This will allow you to reassemble the casing without trapping any wires. Test the unit with your PC or Apple Mac, to ensure that everything works before reassembling (see below). 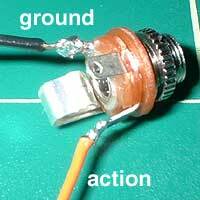 If there are any problems, very carefully inspect the quality of your soldering, and look out for short circuiting. Carefully refit the back casing, taking care not to trap any wires. Re screw all seven screws. Plug the controller into your computer. You should be able to view the controller properties from the Control Panel "Game Controllers" option within your computer settings (PC). Connect switches into all three sockets. You should have control over buttons 7, 8 and 9. Any problems, disassemble and re-check for trapped wires, and the quality of your soldering. 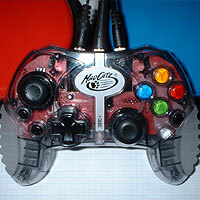 This controller is ready to use with software such as MAME that allow you to user-define your controls. However, for those that don't, use the fantastic free to download utility: JoyToKey. 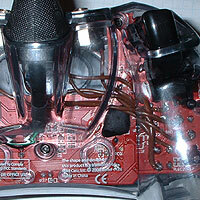 This software enables you to set any button on a JoyPad controller to act as any key or mouse function. In this case switches 7, 8 and 9. For Mac users, USB Overdrive should do the same thing as JoyToKey.